Here are valuable videos and infographics that should be considered when educators are moving to e-setting. Salmon the author of the five stage model provides a scaffold for structured and paced programme of e-tivities. 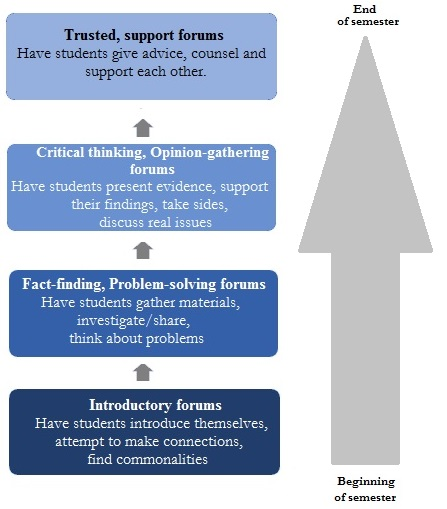 The five-stage-model offers the essential support and development to e-learners at each stage as they build up expertise in learning online ( Salmon, n.d.). Here is a video that briefly explains the model. published by UWA Centre for Education Futures,2016, February 8. Pelz‘s final principle is to “strive for presence”( as cited in Hanover Research Council,2009, July). There are three forms of presence for which to strive in online learning environments: Social Presence, Cognitive Presence, or Teaching Presence (Hanover Research Council,2009, July). In the following video DR. Mark Kassel provide a variety of strategies and advices for educators to be seen, to be heard and be there for their learners. Dr. Mark Kassel discusses establishing teaching presence within a Community of Inquiry in an online instructional environment. Online learning communities can be personally transformational when educators encourage learners bring their own context into the community (Donovan, 2015 October 8). In the following YouTube video, the author provides highlights on the Fully Online Learning Community model FOLC. “TED-Ed is a lesson creator platform that allows educators to structure an assignment around a video and assess students’ engagement with the material”(Online Tools for Teaching and Learning). The following You Tube demonstrates how to use the platform. The following video takes you into the future into a day made of glass. I questioned my readiness for these technical advancements.